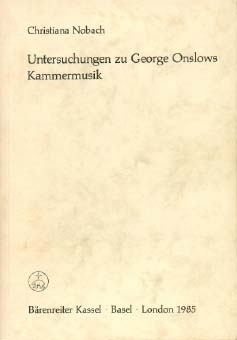 The existing bibliography dedicated to George Onslow was still recently reduced to only one book written by Christiana Nobach and published in 1985 by Bärenreiter, and a thesis published in 1981 in the U.S.A. which was never distributed : none of these writings was translated. Before, you have to go as far back as 1889, a year during which two monographs devoted to the composer were written : one was published in Paris, the other one in Clermont-Ferrand. 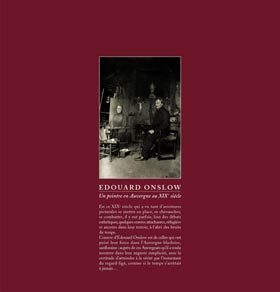 Since then, and taking advantage of the small commemorative event that the 150th anniversary of Onslow's death represented, two other books have been published simultaneously in France, the first complete biography and an essay. We set out to present these books, enlarging more specifically upon the reference biography written by Baudime Jam. George Onslow, the man and the musician. The author of this small 62-page fascicule was an engineer in his profession. As he explains in the foreword, he wrote this monograph at the request of the "Académie des Sciences, Belles-Lettres et Arts in Clermont" : at that time, back in 1884, the one-hundred-year anniversary of Onslow's birth had already gone unnoticed and his name, in Auvergne, "reminded of nothing more than the recollection of a rightly considered feudal lord, highly regarded by his neighbours for his generosity and the courtesy of his manners." Cirice Teillard is thus the first author to have seriously studied Onslow's life by researching through the family archives which constitute the core of his work: the correspondence in particular, but also the reading of the obituaries of Halévy and of the count of Murat, allowed him to go back in a basic way over the career of this "real master of music". Well written and always lively, this story is a good introduction to the knowledge of Onslow, despite its brevity. One will appreciate the intelligence and the skill with which Teillard uses the few sources he has : far from any kind of compilation, he knows how to make an always dialectic use of the documents which were put at his disposal. The result is a decent piece of work which, several times, offers interesting points of view and the outlines of an analysis. Naturally, this book has not been available any more for a very long time: you thus need to go to a library to consult it, knowing that only few own it. A study of George Onslow. A philosophy teacher at the Faculté des Lettres in Clermont, Luguet had access to the same sources as Teillard (by de Pierre's family), but also to another private collection : he nevertheless uses them in a different way. 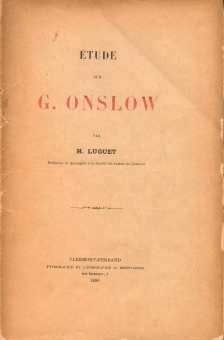 Where his predecessor had incorporated into his text the letters, articles and quotations, Luguet prefers, on one hand, to write an essay freely about George Onslow, and, on the other hand, to reproduce in full a long list of letters extracted from the correspondence of the composer. As for the bibliography, it does not differ from Teillard's and is even enriched by the text written by Marmontel and included in the latter's "Symphonistes and virtuoses". Finally you can find in this 97-page brochure (only 58 of which are written-up by the author), the catalogue of Onslow's work such as it was reproduced in Fétis' article in his "Biographie Universelle des Musiciens". With a more literary style and more lyrical in expressing his feelings, Luguet on the other hand doesn't show himself as up as Teillard as far as music history and aesthetics are concerned : his "study" is full of commonplaces and he is sometimes mistaken in his assessments. His text is nevertheless a very captivating portrait of George Onslow, while being a precious firsthand document. Once more, this publication cannot be found any more except at second-hand booksellers and in public libraries. A study of George Onslow's chamber music. One century after Teillard and Luguet, and while Onslow had sunk into an oblivion which only Carl de Nys tried hard to bring him out of by dedicating himself to the realization of a dozen recordings of his works (see the Discography section), it is a German musicologist, Christiana Nobach, who began to write a piece of work dedicated to the main part of the onslowian catalogue : the chamber music. It is thus through her work that Onslow arouses interest again : therefore, Christiana Nobach's study is exemplary and still remains a reference, even if it is pity that it has never been translated and that it is no longer available from its publisher. You may nevertheless consult it in libraries. The fascinating analysis of Onslow's various creative periods, the description of the way his style evolved, and the outlines of a reflection on the reception of his scores in Germany constitute the key points of a piece of work very easy to read. This study is crowned with a thematic catalogue of Onslow's trios, quartets, quintets and other pieces of chamber music, which is carried out by the book. Out of the 393 pages of this work, about forty of them are dedicated to the biography of the composer : Christiana Nobach naturally knows of Luguet, but she does not seem to have read Teillard. Her sources are enriched by a rich German bibliography (books and press articles) from which she drew numerous very illuminating and unpublished testimonies, as well as by a large number of texts from the 19th century : the result is that it makes of it the best biographical text about Onslow of the time of its publishing. You could also appreciate some iconographic documents judiciously chosen, despite the small number of them. In accordance with the editorial line of our site which privileges dialogue with specialists, we offer you a small interview with Christiana Nobach. 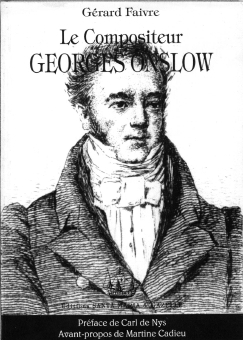 The George Onslow website : In which circumstances were you introduced to George Onslow? Christiana Nobach : I started to become interested in Onslow during my musicological studies at the University of Göttingen. I wanted to write about unknown chamber music: at the same time, one of my colleagues was realizing a piece work on the quartets and quintets of Cherubini and, in the course of its researches, accidentally came across Onslow's works. The G. O. w. : Why did you decide to write a book about the work of this unknown composer? C. N. : I began to write my thesis in 1980 because I was very keen to make chamber music in particular more popular. The G. O. w. : Did you encounter some difficulties to publish it ? C. N. : No because I was in contact with people at Bärenreiter publishing in Kassel. The G. O. w. : Why does Onslow remain so overlooked nowadays ? C. N. : I do not think that he is so much overlooked in Germany : he is still featured on the program of the young German ensembles' concerts and CDs, and I do not understand why the contacts in Germany and in France are so difficult on this subject. The G. O. w. : Let us hope that this situation will change and we shall devote ourselves to it the best we can by offering an English version of our site. Thank you Christiana Nobach. Nota bene : At the same time when Christiana Nobach was starting to write her thesis, an American scholar, Richard Frank, was completing an university study about George Onslow : "George Onslow : A Study of His Life, Family and Works". This writing was published in 1981 by the University of Texas at Austin. Unfortunately, it was never available as a commercial publication. However, it is thus in Germany and in the U.S.A. that the first modern researches on Onslow appeared in the very early 1980's. Still in the U.S.A., one must also mention that Raymond Silvertrust, President of the International Cobbett Association for Chamber Music Research, wrote a series of articles on the string quartets of George Onslow which was published in the Journal of his association between 1997 and 2000. This was, a decade after Mrs Nobach's extensive book, the second serious study devoted to the chamber works of George Onslow. We did not mention this title in our introduction note because it is not a direct product of research literature ; it is nonetheless a text worth mentioning here because it was the only book about George Onslow published in French in the 20th century (although at the last minute), as Carl de Nys very appropriately reminds us in his preface. Gérard Faivre was not a musicologist, but a genuine music lover and a "poet" (C. de Nys) : his reading of Onslow is more intuitive than scholastic, and as such, he makes his contribution to this reduced bibliography a generous and sensitive one. Some interesting documents can nevertheless be found, especially as far as the way Onslow's symphonies were received in Germany. This title is no more available. Gerard Faivre pronounced a number of lectures in order to share with his compatriots his passion for George Onslow : one of them took place on November 30th 1992 at the Société de Géographie Humaine de Paris and was published in the Revue Économique Française. 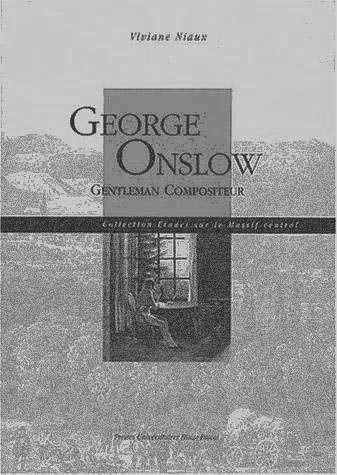 George Onslow : a gentleman-composer. 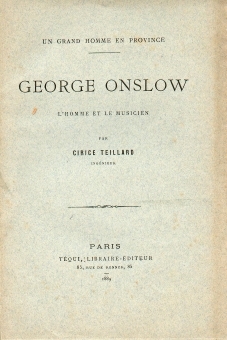 This biography essentially deals with George Onslow's career in Paris : there is quite nothing about George Onslow's career in Clermont while this aspect of his life constitutes a rare as well as a very rich topic, nor about the way Onslow's works were received in Germany and in England. Despite a beautiful edition, this book lacks mainly of a personal vision of Onslow's life which is presented here through a lineary description which does not allow a synthetic understanding of this subject's many problematics. The situation of instrumental music towards the stage repertoire in Paris is well explained, but it is not enough to describe the specificity of the Onslow's work in the XIXth century French province and Europe. It is not exact to describe this book as a biography as many important aspects of the composer's life are just simply not treated : maybe it would have been better if the author had claimed this redactional choice which is interesting, but which does not allow to present this book as a complete biography, whereas this was sometimes written by mistake in some newspapers. 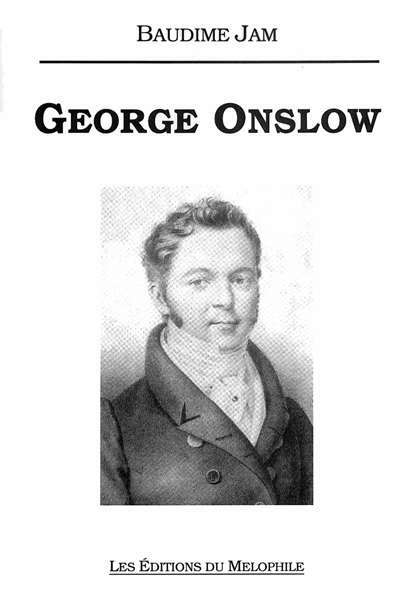 This is the first complete biography of George Onslow (564 pages) ever published : unmistakably the main reference of this bibliography. Besides, the Chamber Music Journal published by the Cobbett Association for Chamber Music Research recently described this writing as the "definitive Onslow book" (Volume XVI #1, Spring 2005). With a lively style where analysis and reflection mingle with debate, Baudime Jam (a musicologist and a musician) achieved an exceptional research work which led him to gather, as much in France (Paris and Clermont-Ferrand) as in Germany and in England, an incredible amount of documents of the time, the majority of which had never been published before. The large chapter dedicated to Onslow's career in Clermont is outstandingly rich : it offers us the very rare opportunity of discovering the conditions of an artist life in a provincial town at the beginning of the 19th century. The totally new archives Baudime Jam used represents a huge amount of research which he knows how to put to the best use by always remaining intelligible and dialectical. This genuine study of the provincial musical life in situ has to be read to realize its significance in George Onslow's life. As for the chapter which deals with Germany and England, not only does it inform us on how very differently Onslow's work was welcomed in both these countries, but it also leads us to appreciate the cultural customs in Germany and in England. We discover at last the complicated reasons why Onslow was not famous in the country of his ancestors. There once more, the amount of archives Baudime Jam gathered is amazing : foreign press articles, unknown writings, letters, etc. We also get to know Onslow's private life through a large abundance of documents which show us a multifaceted character and one big modernist : a composer undoubtedly, but also a good administrator of his publishing interests and a gentleman-farmer. 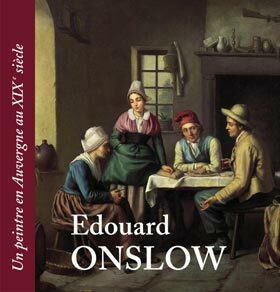 A lover of the countryside of Auvergne, Onslow lived far from the Paris microcosm which he frequented only from time to time while on "business" : discovering his rural life, in detail, especially his involvement in the local everyday life, is fascinating. Once more, Baudime Jam managed to unearth some very rare archives which had never been published before : they help completing his biography with a key chapter which should not have been ignored because it allows to illustrate how the man and the work inevitably become intermingled. The last years of Onslow's life are also very well dealt with. This biography is rather masterly conceived : it puts in perspective a large number of issues by structuring with ease a considerable amount of different sources between which Baudime Jam establishes connections and which he echoes without ever abandoning a genuine sense of criticism and often of controversy. There are nevertheless anecdotes and they pepper, in a very pleasant way, this impressive amount. To its slightest detail, this is an absolute first-rate biography and it bears the mark of intelligence : thus the appendixes are of the highest interest, while avoiding the traps of the genre. Far from compiling, Baudime Jam knows how to keep the pieces of information he needs for his comment, without getting lost in a useless exhaustiveness: the family tree he drew up does not go back a long way and he spares us the listing of first and second cousins and of brothers by alliance ! He also knows how to put an original use of some charts : thus the thematic list he made of the dedicatees of Onslow's works is a brilliant invention ; not only does he avoid the boredom of a chronological list, but he also gives it some meaning by stressing out the dominants (violinists and amateurs) and the minorities (pianists and family members), not mentioning the fact that with every name comes a biographical note as rare as it is precious. He catalogued the Onslow's works in the most thorough way ever and presented them in a most exemplary way. The appendix dedicated to the part played by the folklore of Auvergne in Onslow's work is delightful : we discover that the composer actually borrowed real melodies from the local tradition. As for the three texts of the Bardoux family, they allow to close this large piece of work with an old-fashioned literary note which is not without charm. In adding to that, there is a very first-rate iconography which conceals a large number of unpublished documents, especially one of Onslow with a conducor's baton in his hand and a beautiful portrait of the composer in his early old age - two never before published images. Some people will criticize this book for its austere appearance : it is in fact to counterbalance the richness of its contents which is pleasant and easy to read, which is not always the case in scholastic books. We can however notice the failings of an edition which doubtlessly did not enjoy means of the quality its contents required : one would wish for a well spaced out presentation, but this book would undoubtedly have had to be published in two volumes. We also regret there are so many uncorrected mistakes in the typography which disturbs soemtimes the reading. Let us hope for its author that this biography will make a second publishing with a larger budget. We shall not linger more over this biography and we invite our readers to refer to the interview Baudime Jam was kind enough to give us (see the Interviews section). An English summary of this book is also available on our website . Nota bene : Baudime Jam was recently committed to write an article ("The English origins of the Onslow of Auvergne") published in a book which pays tribute to Edouard Onslow, nephew of the composer and painter who used to live in Auvergne. A website is devoted to this artist : it is managed by the association "The Onslow of Auvergne" and we invite you to visit it.